Freedom to cry covered in ink. Of words you bury in pages. From the marrow of your bones. Now lie in a pool of pages. Welcoming you with stuttering vocals. They told me all of that. Waiting for his masters decaying bones. All bashed with blood and bones. And they reminded me all of that. That words fell short to tell. It holds your lungs under water. At the fall your own characters. From the aftermath of destruction. In narrow passages of papercuts. On the hard concrete pavement. The fall; you were architect of. Now often caresses my words to sleep. Words are the essence of broken things. 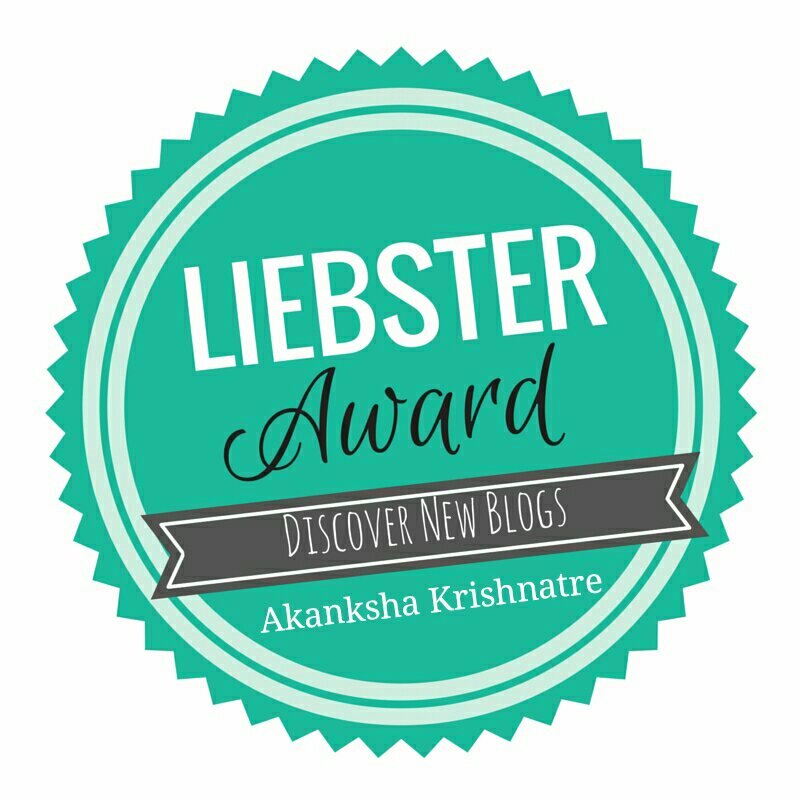 ​My first ever leibster award. My thanks to my blogger friends who have always encouraged me to write and express what I always thought of. Thank a lot to you people for being there. You all are simply amazing. I had never thought I would get this sort of response and truth be told, I feel honoured. My favourite food is anything that is home cooked. These two years of living in a hostel has given me a new found appreciation of home food and its luxuries. Who motivates you to write? Often when introverts look around they realise that the world is full of people trying to give their two cent advice on anything beneath the sun. And amidst this chaos of chatter with no content, artists often find ways to explore ways to express, be it dancing, singing, painting, theatre or writing. Just the realisation that there are not enough people around to listen then papers lend you power to speak to millions, maybe that is what drives me to write. Tell us the Craziest thing that you ever did? The craziest thing that I have done, it is hard to decide to say which one. Does shouting UFO UFO with two friends at night on a road with just a handful of people count as crazy. Well once I also had a lengthy discussion with a wrong number on three o clock in the morning as to who supplies underwears to mowgli in the jungle and why does melody taste so chocolaty. The former was asked by him the later by me. It was a funny day. What is your Favorite Movie and Genre? My favourite movie would be Inception with Leonardo DiCaprio, directed by Christopher Nolan. The Genre I prefer is Action, Adventure and fantasy. Not to forget Sci-fic. What is your Favorite Destination to Travel and why? I love traveling and I have been lucky enough to travel a bit, see a few places and if someone expects me to choose a specific place out of all those then it is just not possible. How does one choose between the flaxen jeweled spanning desert and the white foams like cajoling blankets of the endless ocean. An innate desire to write, to express, to know people who do not know my story and won’t be biased. People who would know me for my writings. Writing to me is passion and blogging helps me take my passion to new levels. What is your Favorite Cartoon Show or Cartoon Movie? My favourite cartoon show is Tom and Jerry and Courage the cowardly dog. I have no inkling of an idea if destiny exists. All I know is that everything happens for a reason. The steps we take give us consequences and we are never left out from the result of our actions. Everything has a beginning and an end and maybe both of them are undetermined depending solely on us. Maybe it is destiny maybe it is not. I guess I will never know. What are the things you like and don’t like about yourself? What I like about me is my determination to do what I feel is right amidst any sort of situation. And what I don’t like about me is that I procrastinate till the last moment to do things that are long due. Different blogging is great for different kinds of people. For me Classic Original blogging works best. It gives me the way in which I like to express my words. Do you think that turning your Hobby into your Profession is a Good Idea? Turning Hobbies into profession is a great idea till the moment the hobby has enough potential to keep you going. For me my hobby is writing and performing written pieces and no I don’t want it as a profession. I want my profession to be in the field as a civil servant. So it is an amazing idea, just not the one for me. Eleven Bloggers I think are deserving of this award. Eleven random facts about me. I am the youngest one in my family. I aspire to be a civil servant. I can fluently speak three languages and write in two. I am not much into resteraunt foods. They are great and all but home food is what I would rather have. I hate swearing. The cute little F words just make me cringe. I have got no idea as to why. I like to perform poetry as per in a performance poetry ( aka poetry slam) but I also love the traditional written works. I am good at sports and am athletic. I like soccer (Football) and kabbadi. Still could not understand cricket. I live in a lodge with two roommates. Both are a bunch of sunshine (clad in clouds of mischief). I have watched TV. Series like F.R.I.E.N.D.S, The originals, Doctor Who, Sherlock, Mentalist and yada yada yada. I love reading books and can read any genre except romance and young adult ( stay away from them). My favourite book is 100 years of solitude by Gabriel Graçia Marqhuez. I am 16 years old and intolerably lazy. Eleven questions for my awesome nominees. 1) What is your favourite book and why? 2) What pushes you to pick the pen each day? 3) What are your hobbies like? 4) What do aspire to become someday? 5) Did any character of a book or a movie move you in some way? Who was it? 7) What does writing mean to you? 8) Life to honour or honour to life? 9) Did you ever do something crazy? 10) What sort of world would you want to see? 11) Traditional Writings or something different? And there you go, I did my part. Thank you again Himanshu for this award. P.S I did an amazing happy dance after getting nominated. The dance consisted of me flapping around like a headless chicken from one furniture to another.